Jomalig Island in Quezon is worth visiting. Do you want to stay away from the city and want to go somewhere peaceful and beautiful, then Jomalig Island may be the answer. A budget of Php4,000 for 3 days and 2 nights is sufficient. 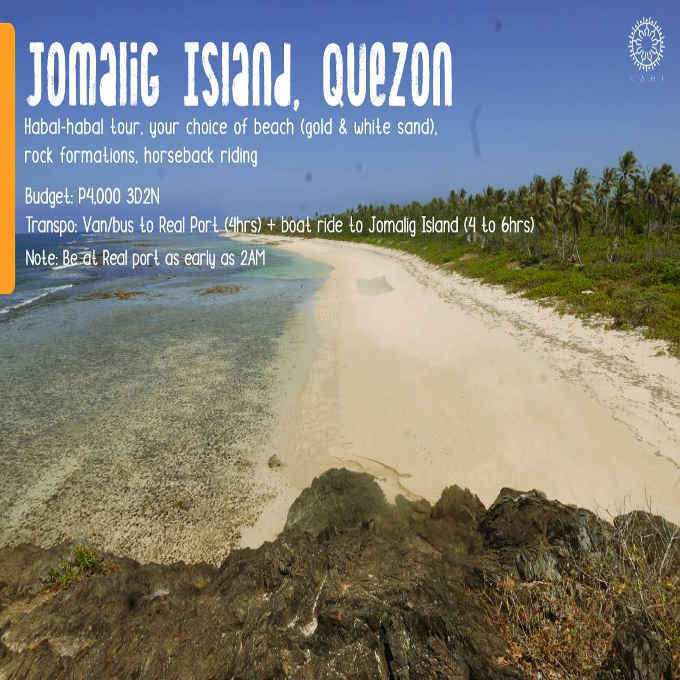 What can you do in Jomalig Island you might ask? Well, among the things you can do are horseback riding, sight-seeing its beautiful rock formations, Habal-Habal Tour, and a lot more. A Van or Bus ride to Real Port will take 4 hours and the boat ride to Jomalig Island will take 4 to 6 hours. It is advised that you should be at the Real Port as early as 2 AM. Jomalig rests in a small archipelago in the Lamon Bay, in the western regions in the province of Quezon. Located 110 kilometers from Manila, Jomalig is the last in a series of islands that protrude into the deep blue seas of the Pacific Ocean. The name Jomalig is pronounced ‘hu-ma-lig’ and the legend of its name is simply an act of pure love, infatuation and beauty. Centuries ago the ancient leader of Jomalig had a prized possession, a beautiful daughter. A young man from one of the neighboring islands asked the leader for his daughter’s hand in marriage. The leader commanded the young gentleman to a challenge before he was allowed to marry his daughter – he requested the boy to spear three fish from every pond on the entire island. The high spirited gentleman accepted his offer but was met with defeat. Hopeless and destitute he asked the young lady for a kiss before he departed the island, and the people of the island began to shout “Humalig”, “Humalig” and the beautiful girl kissed the young man. Reaching the island of Jomalig is an adventure in itself. The region is only accessible by small boat or private aircraft as the airstrip on the island is very short.